Turn a few pieces of lumber into a raised bed in your garden with help from these Panacea Raised Garden Bed Brackets. These four, solid steel brackets are specifically designed to affix to 2 x 6 or 2 x 12 wooden slats (not included), and the 90° angle on each creates a precise corner. A small lip beneath the solid top of each bracket helps the lumber remain securely upright, and predrilled holes on each piece accommodate the included screws for quick assembly. The level base of each bracket rests on the ground or may be inserted slightly into soil, and the steel construction offers strength. The black, powder coated finish protects the brackets from elemental wear, and extra predrilled holes allow you to further secure the pieces if desired. 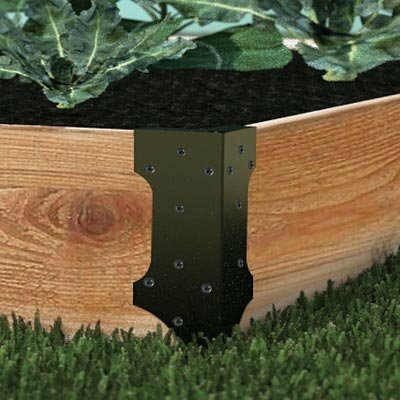 Easily create a raised flower or garden plot with these Raised Garden Bed Brackets. This description refers only to the Panacea Raised Garden Bed Brackets. The lumber shown is not included. Greenes Fence Premium Cedar Raised Garden Bed, 16" x 48" x 16.5"